Universal Monsters The Phantom's Curse slot is a bit of a mouthful as titles for games go, but its the name of NetEnt’s opera-inspired video slot. Not to be mistaken with Microgaming’s The Phantom of The Opera, which was released prior to this game and was the main reason this slot has a different name to what was originally intended. It is based on the 1925 silent movie The Phantom of the Opera and is licensed through Universal Studios motion picture company. There is a typically theatrical look and feel to the slot, which is set on the performance stage. Symbols float on a background of a large, empty theatre hall, with lights dimly lit and the sounds of a dramatic orchestra in accompaniment. The Phantom’s Curse has a fairly standard set of 5 reels over 4 rows with a total of 40 paylines. 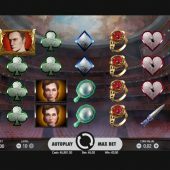 However, the interesting caveat here is that wins pay left to right and right to left, typical of IGT MultiWay slots like Siberian Storm or Hexbreaker 2. The top paying symbol is The Phantom, paying 200x for 5-of-a-kind (5OAK). He is followed by Christine 100x for 5OAK and Ring, Flower, Mirror and Dagger paying between 60x and 40x. The card symbols Hearts, Spades, Diamonds and Clubs pay a less generous 20x for a 5OAK hit. The Mask Wild and Stacked Mask Wild will replace all symbols except the Scatter and bonus symbol. 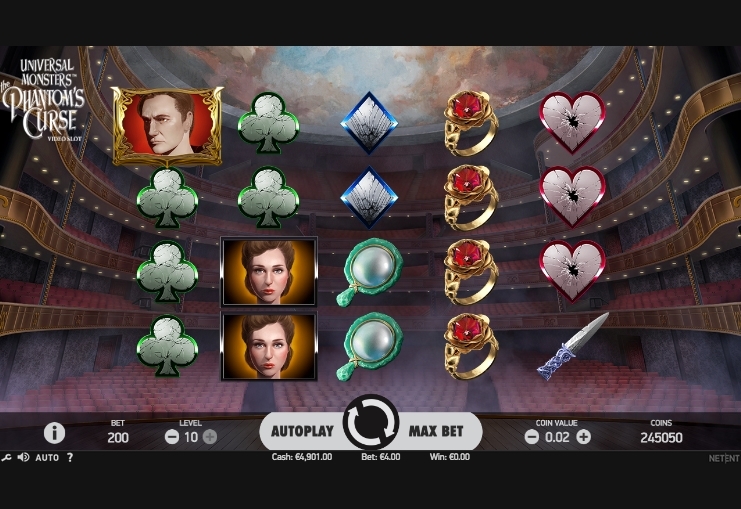 Both the first and last reel can contain Stacked bonus symbols, which when they land fully, will release a Pick and Click bonus. The Stacked Phantom must appear on the 1st reel, whilst the Stacked Christine symbol appears 5th reel to activate. There are 2 stages to this feature; pick 8 roses in stage 1 and progress to stage 2 having also picked up some cash prizes. You then choose a mirror from a choice of 3, which will give you a multiplier to apply to your winnings from stage 1. Sounds good in principle, but there is a poultry 36x maximum win on this feature. The Masked Phantom Re-spin feature is triggered by landing a full set of Stacked Phantom symbols on reel 1 and a Stacked Mask symbol appears on the 5th reel. In this feature the stacked symbols that triggered the re-spin turn into Wilds and will hold for 1 re-spin. Still with me? I hope so, as there is a lot going on in this game. Free Spins are triggered by landing the Scatter symbols on reels 1, 3 and 5 only. There are potentially unlimited spins in this feature as there is not a set amount of spins awarded. Instead, every time the Phantom symbol occurs on a particular reel he will slit on the the ropes holding up the Chandelier. Once all 5 ropes are cut the feature will end. From my experience the ropes tend to get cut far too quickly. but this may not be the case for everyone. One thing worth mentioning is that the Phantom symbols turn Wild in the free spins feature, however it may all be over before you get any real benefit from this. This isn’t NetEnt’s finest hour in my humble opinion. The game has a very unmemorable name (probably of no fault of the developer), the graphics are average at best and the gameplay feels very underwhelming. This is a real shame as the intro promised a lot, but the game just didn’t live up to its billing. The main consolation is an impressive 96.57% RTP and the potential of an 800x win in either the re-spin or free spins feature. However, this is possibly one musical that I will unlikely be in attendance, preferring to ply my wares on other slots like Planet of The Apes or The Legend of Shangri-La.